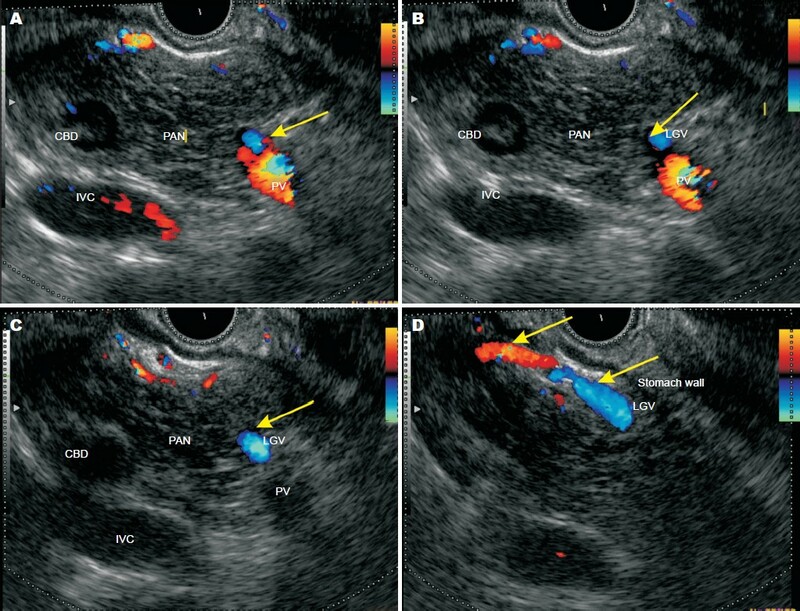 The use of Color Doppler in endosonography has enabled detailed real-time assessment of the abdominal vasculature. Standard stations are used during the routine evaluation on endosonography. 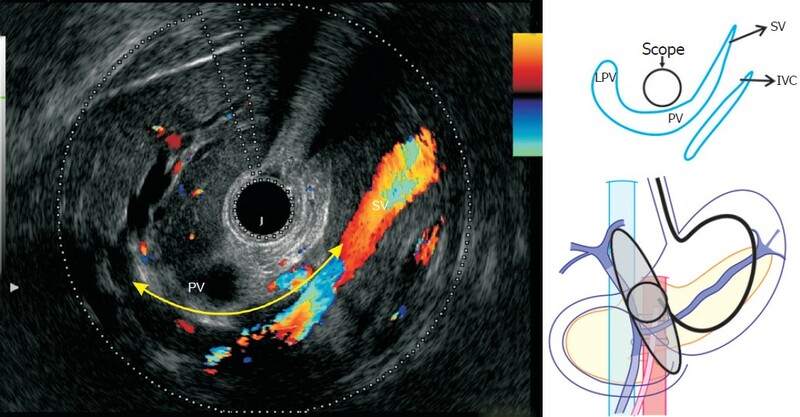 However, the imaging techniques do not describe the vascular imaging of the portal venous system and its tributaries, in detail. 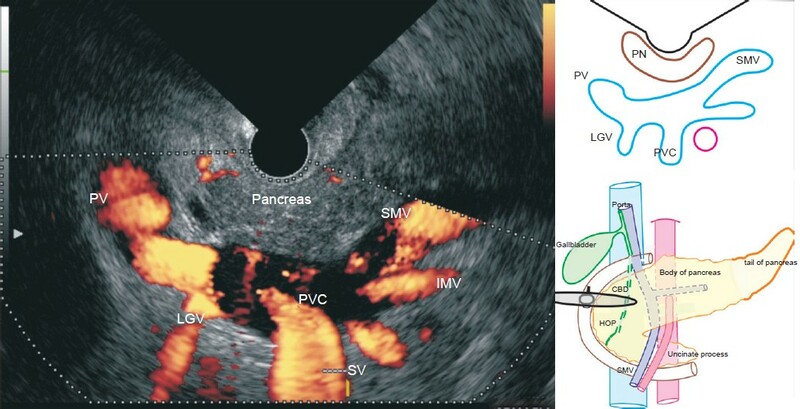 The evaluation of the portal venous system and its tributaries is important in staging pancreatic malignancies and in assessing portal hypertension. 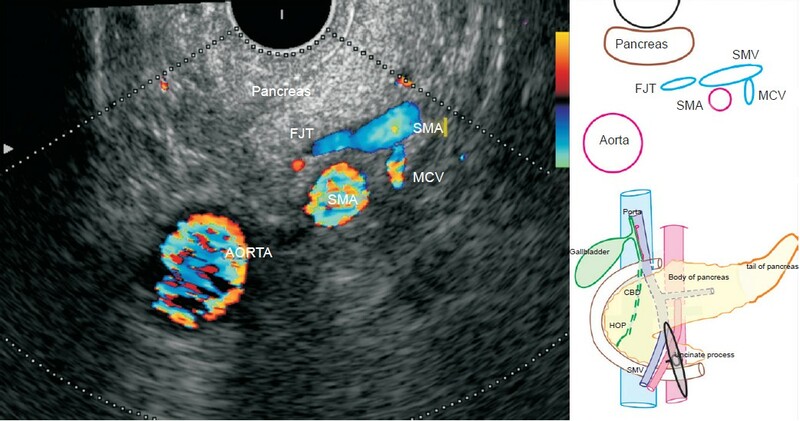 This article demonstrates the normal findings on the portal venous system and its tributaries using radial endosonography. Figure 1. The formative tributaries of the splenic vein, tributaries of superior mesenteric vein (gastrocolic trunk, first jejuna vein), and portal vein (left gastric vein) are easily seen. 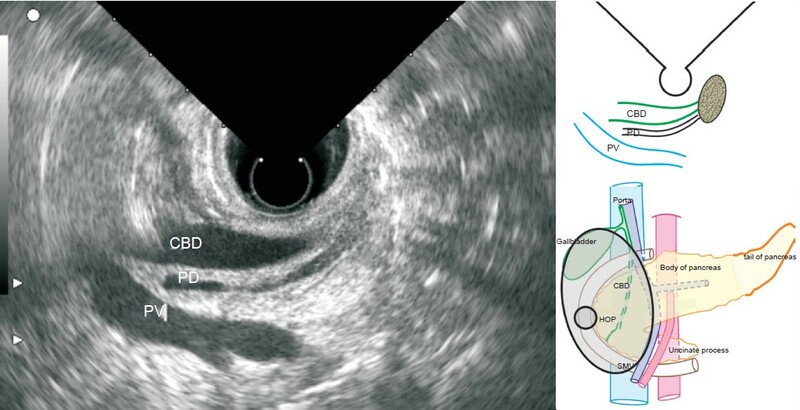 Inferior mesenteric vein has a variable joining mechanism and may be difficult to find on radial endosonography. Posterior superior pancreatico duodenal vein and left gastro-epiploic artery are seen persistently. Other tributaries are untraced and may be difficult to find. Figure 2. 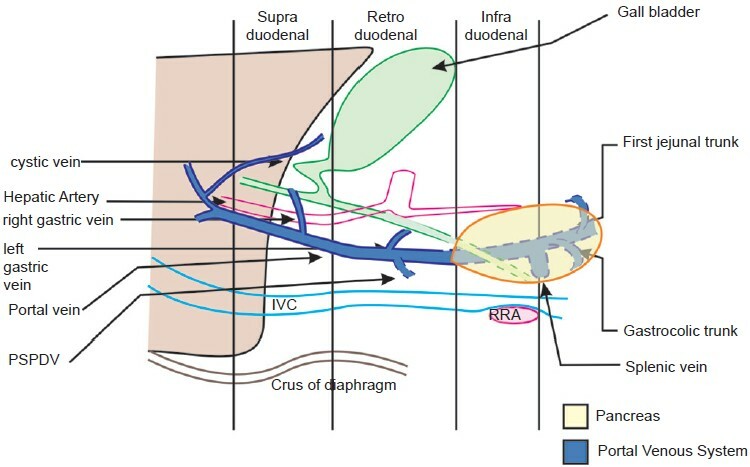 A composite antero-posterior diagram for the joining of the tributaries of the portal vein. The structures posterior to the duodenum can be divided into three hypothetical areas to understand the interchange in the relationship among the common bile duct, portal vein, and hepatic artery. A: Supraduodenal : Portal structures maintain VAD or occasional VDA configuration (the artery is hepatic artery); B: Retroduodenal : Portal structures maintain VDA configuration (the artery is gastroduodenal artery); C: Infraduodenal : Portal structures maintain DVA configuration (the artery is gastroduodenal artery). The splenic vein is formed at the splenic hilum by the joining of 3 to 6 splenic tributaries and the left gastroepiploic vein. 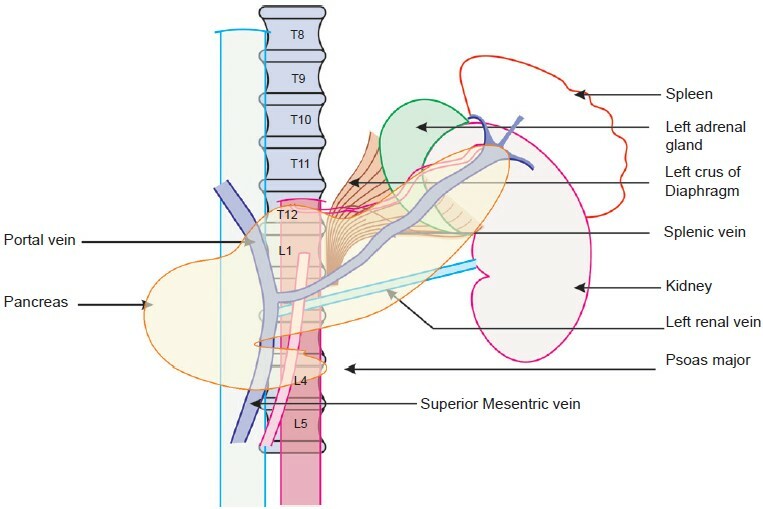 The major anatomical relations and tributaries of the splenic vein are shown in [Figure 3]. Figure 3. 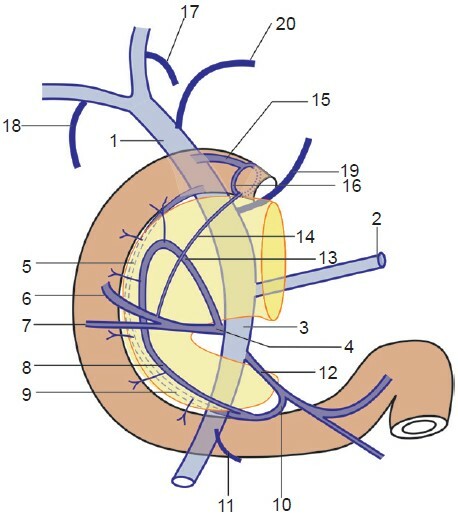 A composite antero-posterior diagram for the joining of the tribTributaries and anatomical relations of the splenic vein. The splenic vein runs along the posterior border of the pancreas up to its neck, where it joins the superior mesenteric vein. The posterior relations of the splenic vein are the left renal vessels, left adrenal gland, left crux of the diaphragm, and the superior mesenteric artery. The tributaries of the splenic vein are the left gastro-epiploic vein, the inferior mesenteric vein, the short gastric vein, and the posterior pancreatic veins. The left gastro-epiploic vein, inferior mesenteric vein, and posterior pancreatic veins are traced in radial endosonography. Figure 4. EUS can attempt to identify pancreaticoduodenal veins which drain the head of the pancreas and the adjacent second and third portions of the duodenum. There are four pancreaticoduodenal veins which form an anastomoses between the superior and inferior veins. The two major tributaries of superior mesenteric vein are the gastrocolic trunk and the first jejunal trunk which join the SMV roughly at the same level but on opposite sides. 1 = Portal vein, 2 = Splenic vein, 3 = Superior mesenteric vein, 4 = Gastro colic trunk, 5 = Posterior superior pancreatico duodenal vein, 6 = Right gastroepiploeic vein, 7 = Right colic vein, 8 = Anterior inferior pancreatico duodenal vein, 9 = Posterior inferior pancreatico duodenal vein, 10 = Inferior pancreatico duodenal vein, 11 = Middle Colic vein, 12 = Ist Jejunal trunk, 13 = Anterior superior pancreatico duodenal vein, 14 = Duodenal vein-Subpyloric vein, 15 = Duodenal vein-Suprapyloric vein, 16 = Prepyloric vein of Mayo, 17 = Paraumbilical vein 18 = Cystic vein, 19 = Left gastric vein, 20 = Right gastric vein. Endosonography technique widely varies among different operators. It is dependent on detailed anatomical knowledge and real-time correlation of images. Initially, the three major veins [superior mesenteric vein (SMV), splenic vein, and portal vein] are identified at standardized abdominal stations. The tributaries that join the vein are visualized during the application of the color Doppler over the vein, and slowly following its course. The course and the anatomical relations of the tributaries with the surrounding structures pinpoint the exact name of the tributary. Imaging of the portal vein can be done from three places. 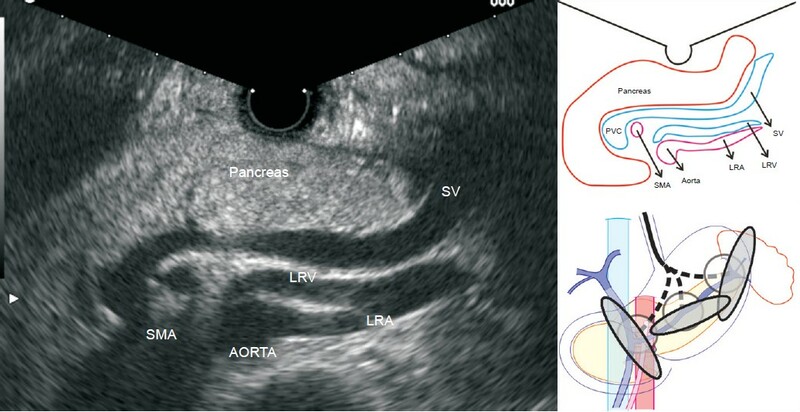 The portal vein is monitored starting from its formation at the club head appearance of the portal venous confluence (PVC). Monitoring requires finding the club head and deflecting the tip of the echoendoscope counter clockwise to follow the portal vein into the liver, from the antrum. At this point, suitable water inflation is conducted in a balloon to visualize the course of the portal vein, which wraps the whole scope from the 3 o'clock position to the 10 o'clock position [Figure 5]. Figure 5. The echoendoscope is positioned in the antrum. The portal vein is seen all around the scope from the portal venous confluence (4 o'clock) to the hilum of the liver (8 o'clock). The splenic vein is seen from the 2 o'clock to the 4 o'clock position. The portal vein is separated from the inferior vena cava (IVC) near its formation, but tends to come close to IVC as it ascends in the retroduodenal area. 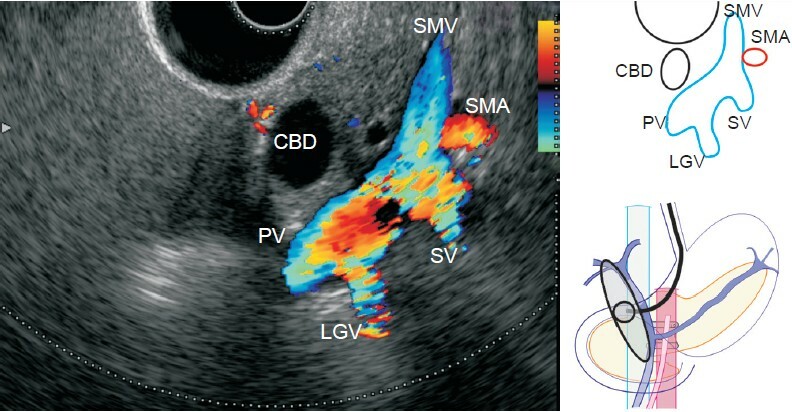 The portal vein anterosuperiorly takes a cresentric curve to move away again from the IVC while ascending in the porta hepatis. Following the portal vein down from the hilum towards the PVC is done by wedging the scope into the duodenal bulb. After the echoendoscope being placed in the duodenal bulb, the balloon is re-inflated, and the probe is pushed against the superior duodenal angle in a long loop. The portal vein is visualized as the largest vascular structure and can be followed via scope manipulation. Scope manipulation requires a combination of right-and-left and up-and-down movements, along with right-and-left torque, of the scope [Figure 6]. Figure 6. The scope is pushed in the duodenal bulb and the balloon is inflated. In this position, the main portal vein is seen in the longitudinal section. The superior mesenteric vein is seen joining the splenic vein to form the main portal vein behind the common bile duct. The pancreatic duct is also seen from the 4 o'clock to the 7 o'clock position. The portal vein is radiologically up to 1.6 cm in diameter and about 8 cm long. 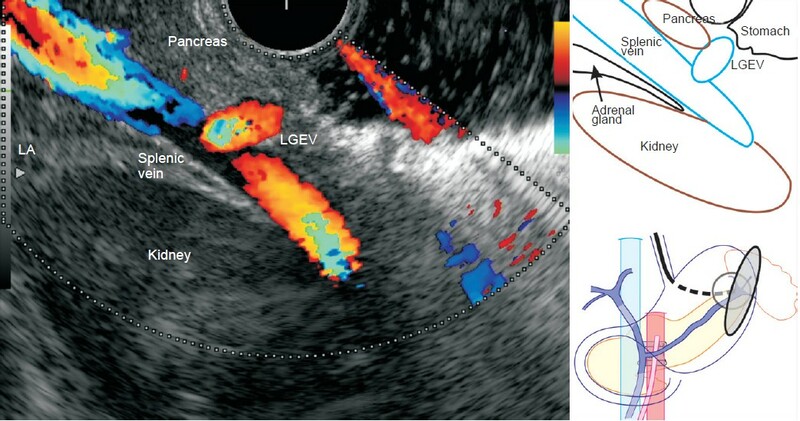 Imaging of the portal vein is also possible from its point of formation in the descending duodenum by placing the echoendoscope near the ampulla and inflating the balloon [Figure 8]. When the scope is slowly pulled back with the inflated balloon, it gets wedged near the superior duodenal angle, and the portal vein is traced as a structure, parallel and deep to the common bile duct (CBD). 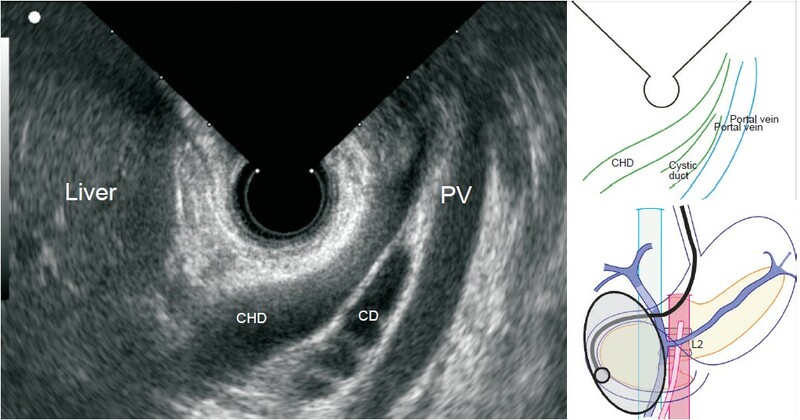 The simultaneous demonstration of the three structures (CBD, pancreatic duct, and portal vein), in a longitudinal axis, is called the stack sign [Figure 7], [Figure 8]. Figure 7. The endoscopic ultrasound scope is wedged with the inflated balloon beyond the superior duodenal angle. The bile duct is seen in the longitudinal axis. The portal vein and the pancreatic duct are seen lying deep into the bile duct in this axis. The demonstration of these structures in the longitudinal axis, on endosonography, is called the stack sign. Figure 8. The echoendoscope is positioned in the descending duodenum. The slight torque at this position reveals that the portal vein lies in the longitudinal axis, posterior to the common hepatic duct and cystic duct. 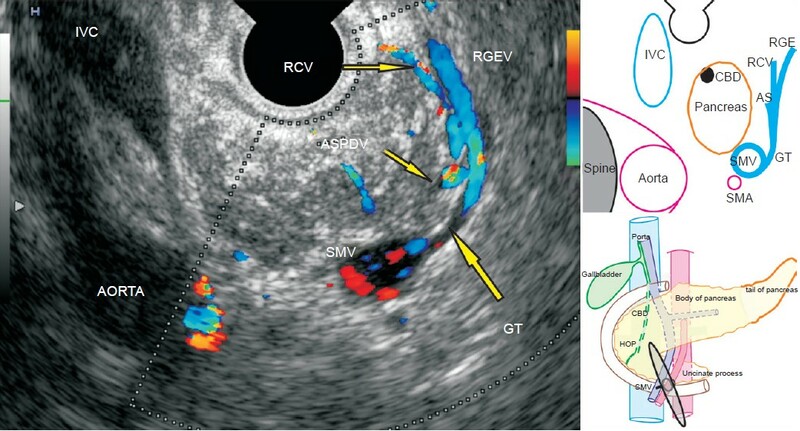 The borders of the portal vein are traced after the application of the color Doppler on a segment of the portal vein, and slowly following the tributaries. The joining of the left gastric vein is seen into portal vein depending on the position of the echoendoscope [Figure 9], [Figure 10], [Figure 11]. 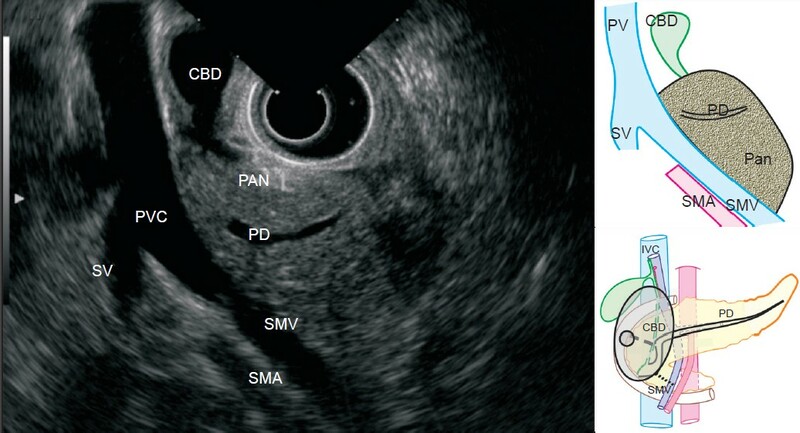 The surface away from the endoscope corresponds to the posterior surface of the portal vein, where the joining of posterior superior pancreatico duodenal vein (PSPDV) is seen [Figure 12]. Figure 9. The endosonographic image from the duodenal bulb shows the normal anatomy of the main portal vein and its truncal tributaries. In this case, the main portal vein is seen in the longitudinal axis and the left gastric vein is seen merging into the left antero-lateral aspect of the portal vein. Figure 10. The left gastric vein has some anatomical variations and a variable that joins the portal venous system. In one-third of the cases, it joins splenic vein; in another third, it joins the portal venous confluence; and in the final third, it joins the portal vein. Figure 11. The endosonographic image from the duodenal bulb shows the normal anatomy of the main portal vein at its formation. The superior mesenteric vein is seen merging with the splenic vein to form the portal vein. Dilated common bile duct is seen lying in front of the portal vein, and the left gastric vein is also seen joining the portal vein. Figure 12. The main portal vein is seen in the longitudinal axis. The posterosuperior pancreaticoduodenal vein is seen merging into the right posterolateral surface of the portal vein. Posterior superior pancreatico duodenal vein is the only vein that joins the posterior surface of the portal vein. The veins that drain the head of pancreas are the anterosuperiorly pancreaticoduodenal vein, the postero-superior pancreaticoduodenal vein, and the inferior pancreaticoduodenal vein. Anterior superior pancreatico duodenal vein descends and joins the gastrocolic trunk, whereas inferior pancreatico duodenal vein crosses the superior mesenteric vein to join the first jejunal vein. PVC is an important landmark and lies at the level of the L2 vertebrae, behind the neck of pancreas. At this point the joining of the left gastric vein and the inferior mesenteric vein may be seen [Figure 11], [Figure 13]. Figure 13. 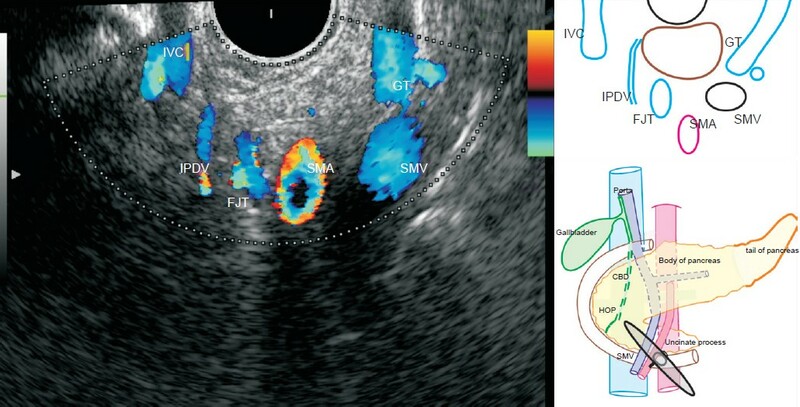 The endosonographic image, in a case of portal hypertension from the duodenal bulb, shows the normal anatomy of the main portal vein at its formation. The superior mesenteric vein is seen merging with the splenic vein to form the portal vein. The left gastric vein is seen joining the upper border of the portal venous confluence. Inferior mesenteric vein is seen joining the lower border of the portal venous confluence. The splenic vein is best visualized at a 44-cm distance in the body of the stomach as a transverse structure posterior to the pancreas, with the tip of the scope in the neutral or the slightly tilted up position to be closer to pancreas. The 44 cm distance from incisor usually places the probe anterior to aorta and pancreas about 2 cm below the origin of celiac artery in a normal person. The course of the splenic vein is followed by the clockwise torque of the scope to the left (towards the splenic hilum) and by the counter clockwise torque toward the PVC. 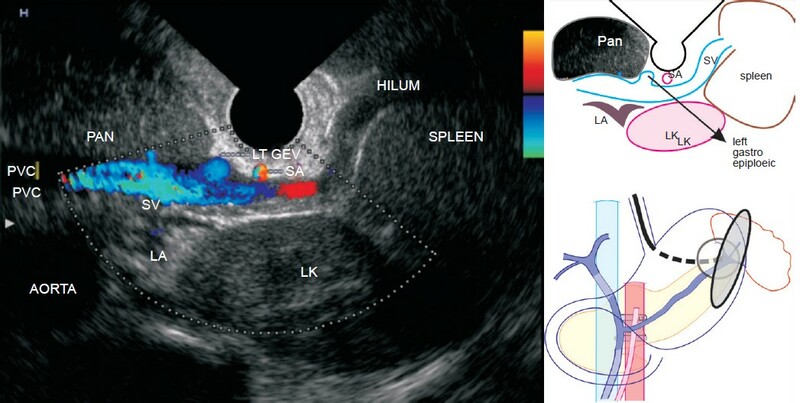 Clockwise torque sometimes requires slight pulling out of the scope and turning up the tip to trace the downward sloping course from the splenic hilum [Figure 14]. Figure 14. The entire course of the splenic vein is seen behind the pancreas from the splenic hilum to the portal venous confluence (3 to 7 o'clock). The superior mesenteric artery is seen in a classical club and ball appearance. The vessels that lie transversely posterior to the splenic vein are the left renal vein that crosses the aorta and the left renal artery that comes from the aorta. 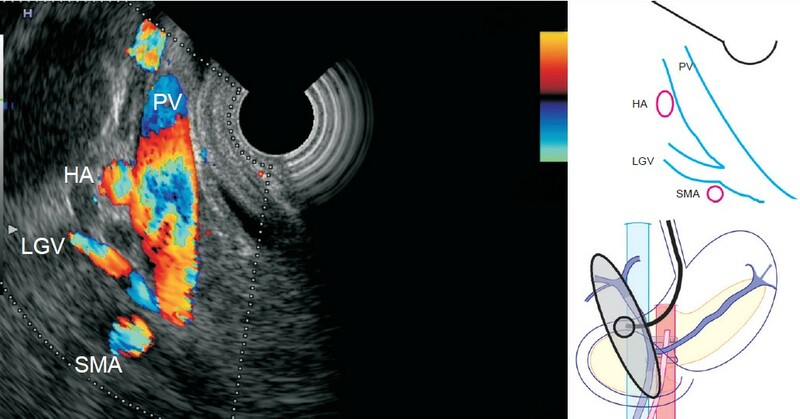 Color Doppler is continuously applied to follow the entire course of the splenic vein and to visualize the joining of the tributaries on its anterior. The posterior pancreatic veins come from the pancreatic parenchyma [Figure 15]. The tributary, which moves close to the wall of the stomach, is identified as the left gastroepiploic vein [Figure 16], [Figure 17]. Figure 15. 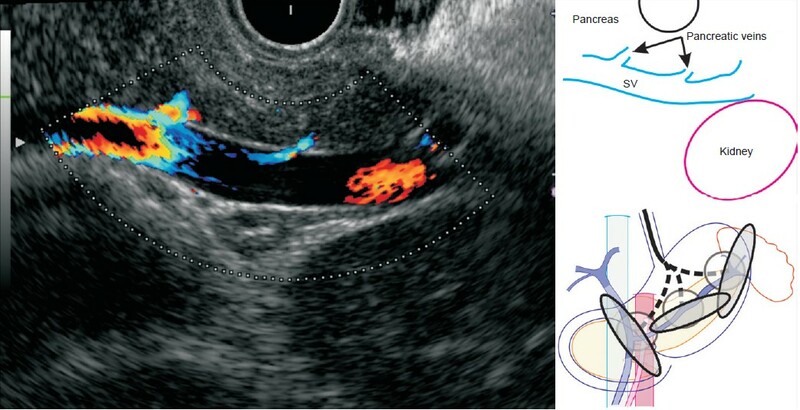 Endosonography from the stomach reveals 3 to 13 short pancreatic tributaries that join the anterior surface of the splenic vein, which lies in close opposition to the posterior surface of the pancreas. The venous drainage of the body and the tail of the pancreas go through 3 to 13 posterior pancreatic veins, whereas the pancreatica vena magna goes into the splenic vein. Figure 16. The entire course of the splenic vein is seen behind the pancreas. The segment of the splenic vein towards the splenic hilum is selected for evaluation, and a color box is applied. 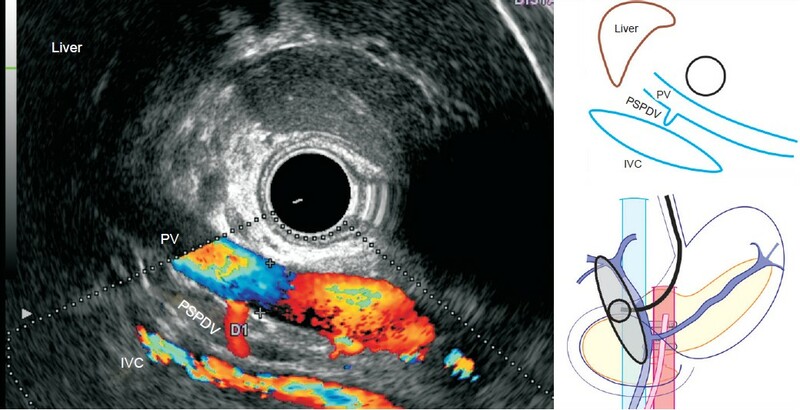 During the continuous application of the Color Doppler and the slow movement of the echoendoscope along the anterior border of the splenic vein, the gastroepiploic vein is seen merging into the anterior of the splenic vein, very close to the splenic hilum. The splenic vein, near its formation at the splenic hilum, receives left gastro-epiploic vein, as a tributary, from the wall of the stomach. The left adrenal gland is also seen lying posterior to the splenic vein. Figure 17. The endoscopic ultrasound from the body of the stomach shows that the left gastroepiploic vein terminates into the splenic vein. In this case, the spleen is enlarged and the splenic vein is seen taking the course anterior to the left kidney (5 o'clock), the left adrenal gland (7 o'clock), and the aorta (8 o'clock), while lying posterior to the body of the pancreas. SMV imaging can be done from two places. 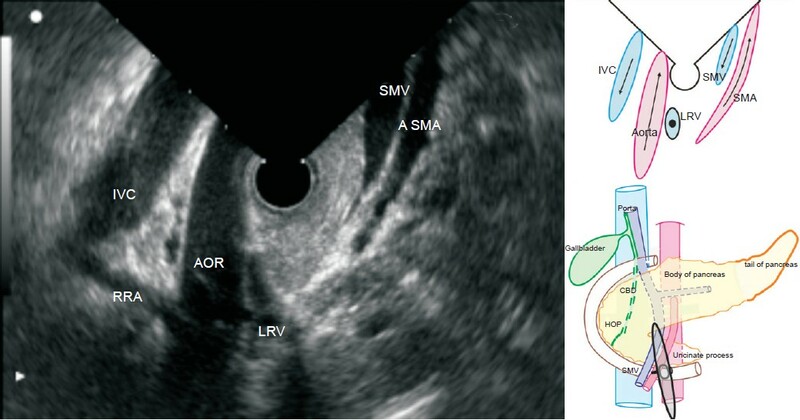 SMV is initially visualized from the horizontal duodenum, with the scope in the neutral position. In this position, SMV is located in the standard V-shaped reverse orientation of the major vessels, with the aorta and the inferior vena cava (IVC) on the left and the superior mesenteric artery (SMA) and the SMV on the right [Figure 18]. Figure 18. The endoscopic ultrasound of the horizontal duodenum shows the superior mesenteric vein and the artery in a V-shaped orientation, anterior to the echoendoscope (on the right side of the image), and the aorta and inferior vena cava lies posterior to the echoendoscope (on the left side of the image). The uncinate process lies at the middle of the image between the V-shape. In this position, the effort of the endosonographer, on real time imaging, should be to concentrate only on one vessel during withdrawal. On progressive withdrawal of the echoendoscope, superior mesenteric vein can be traced closely to the uncinate process of the pancreas, and the merging of the tributaries into the trunk is visualized. When the scope is positioned at the third part of the duodenum, an inverted appearance of the aorta is seen. The aorta is seen on the left side of the screen, and the superior mesenteric artery is seen on the right, with the scope positioned in the descending duodenum. The normal image A is inverted in B to explain the appearance of the inverted "V" when the scope is positioned at the third part of the duodenum. The course of SMV is followed until it joins the splenic vein. The joining of the splenic vein with the portal vein is seen in the form of a stub. Tilting up the scope or keeping the knob neutral is required for the orientation of SMV in a longitudinal or transverse axis. The surface of SMV, which lies close to the scope, is the posterior surface, on which no tributary joins. The surface, which lies away from the scope, is the anterior surface, on which the middle colic vein may join. 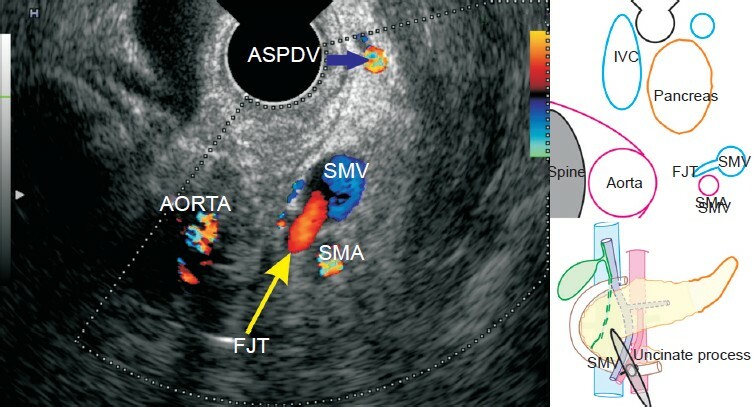 The first jejunal vein lies between the aorta and the SMA, and goes anteriorly towards the SMV to join its left border, whereas the gastrocolic trunk joins the right border [Figure 19], [Figure 20], [Figure 21], [Figure 22]. Figure 19. Endoscopic ultrasound from the horizontal duodenum (3rd Part). The first jejunal vein is seen posterior to the superior mesenteric artery just before it merges into the superior mesenteric vein. The first jejunal trunk generally crosses posterior to the superior mesenteric artery, whereas the inferior mesenteric vein crosses anterior to the artery before joining the superior mesenteric vein. Anterior superior pancreatico duodenal vein is also seen in this figure. Figure 20. Endoscopic ultrasound on the withdrawal of the scope from the horizontal duodenum (D3). The gastrocolic trunk and its tributaries are seen merging with the superior mesenteric vein. The gastrocolic trunk is a short and highly variable vein and is formed by the joining of the right gastro-epiploic vein, the right colic vein, and the anterior superior pancreatico-duodenal vein. All three tributaries are seen in this image. Figure 21. The endosonographic image from the horizontal duodenum angle shows that the superior mesenteric vein (SMV) tributaries lie close to the uncinate process of the pancreas. At this point, two major veins (the first jejunal trunk and the gastrocolic trunk) join the SMV roughly at the same level, but on opposite sides. In this case, a variation of the middle colic vein is seen joining the gastrocolic trunk just before joining the superior mesenteric vein. The inferior pancreaticoduodenal vein, which is a tributary of first jejunal trunk and runs posterior to the uncinate process, is also seen in this image. Figure 22. Endoscopic ultrasound on the withdrawal of the scope from the horizontal duodenum reveals two tributaries joining the superior mesenteric vein (SMV). The first jejunal trunk goes between the superior mesenteric artery and the aorta to join the right posterolateral surface of SMV. The middle colic vein merges into the anterior of the superior mesenteric vein. 2. Saddik D, Frazer C, Robins P, Reed W, Davis S. Gadolinium-enhanced three-dimensional MR portal venography. AJR Am J Roentgenol 1999; 172: 413-7. 3. Mori H, McGrath FP, Malone DE, et al . The gastrocolic trunk and its tributaries: CT evaluation. Radiology 1992; 182: 871-7. 4. Crabo LG, Conley DM, Graney DO, et al . Venous anatomy of the pancreatic head: normal CT appearance in cadavers and patients. AJR Am J Roentgenol 1993; 160: 1039-45. 5. Ibukuro K, Tsukiyama T, Mori K, et al . Peripancreatic veins on thin-section (3 mm) helical CT. AJR Am J Roentgenol 1996; 167: 1003-8. 6. Vedantham S, Lu DS, Reber HA, et al . Small peripancreatic veins: improved assessment in pancreatic cancer patients using thin-section pancreatic phase helical CT. AJR Am J Roentgenol 1998; 170: 377-83. 7. Douglass BE, Baggenstoss AH, Hollinshead WH. The anatomy of the portal vein and its tributaries. Surg Obstet Gynecol 1950; 91: 562-76.